As mentioned in the first video analysis post I made a couple of months ago, there’s a lot that can be learned just by watching a clip and breaking down each little element, asking yourself “When Team A does this, how does Team B react / not react?” Rugby’s a really simple cause-effect invasion game, with line breaks being easy to explain locally – at the point where the defence is breached (i.e. a poor tackle) – or as the result of several attempts at breaking the line (i.e. defenders over-committed to previous break downs, leaving fewer out wide on the key phase). In this second instalment I’m going to attempt to explain some subtleties behind a very simple attacking element – depth. In this try by Scotland over Ireland last year, the announcers praise it as a well-rehearsed move, but I think the real beauty in it is the advantages created by the two deep passes made that allows De Luca to get free, who sets up Ansbro from the game-winner. 1. Stop at 10:30… the line out throw has been tapped down and played quickly. 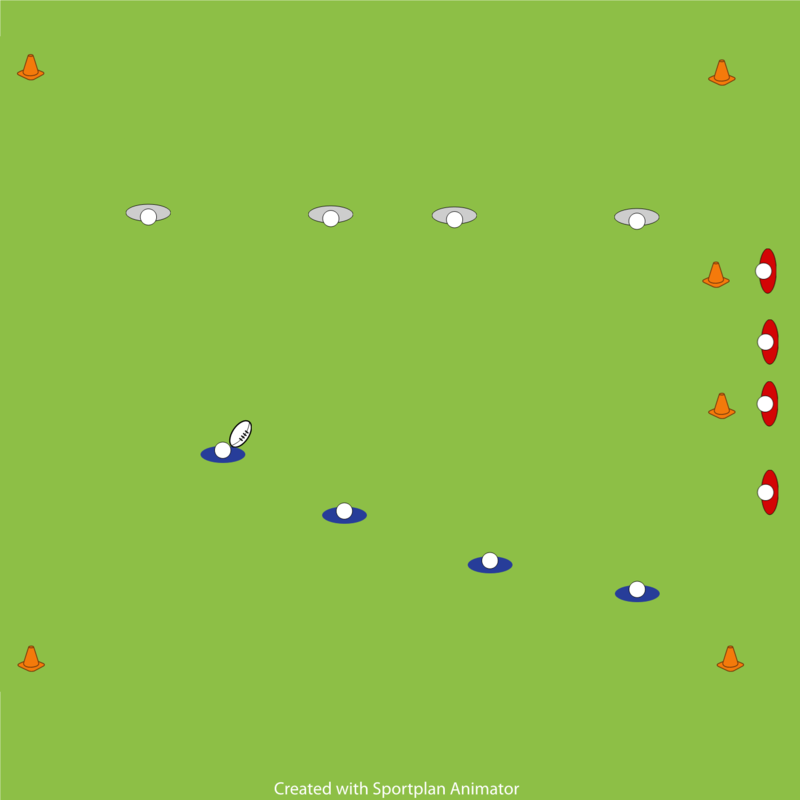 A decoy runner causes the Irish defence to condense itself and hesitate its forward pressure. Catching a defender flat footed is a great opportunity as he won’t easily be able to adjust to your sudden changes of movement. 2. Stop at 10:32… the pass has been played deep and the passer is already looking to go wide with another pass. This is often where I’d expect to see teams use the strike runner, intending the second receiver to take advantage of the decoy’s effect on the defence. Scotland, however, have banked on this and are using that second receiver, merely as a pivot. He barely runs at all with the ball and is already turned to fire a wide pass. a. The defensive line again hesitates because the passer has two hands on the ball and obviously isn’t going to bash it up right away. Some players, like the Dan Carters of the world, shift into another gear and look to exploit flat footed defenders by attacking the space, often toward the inside shoulder of the next defender outside. This player either takes him, or stays on his man, presenting a great 2 v 1 situation. This doesn’t happen here. b. The potential to, instead, pass to a deep runner presents a situation where the defender in front of him often gets caught in two risky situations. In one case, he opts to maintain a flat defensive line with his team mates – giving the receiver of the deep pass lots of time and space to do as he wishes, and many great outside centres will attempt to beat his man on the outside or draw in the winger to put his man away (Conrad Smith is often the benefactor / orchestrator of just such a situation). The other case – which we see here – sees a defender who either gambles or panics by rushing up early to close the space and make a hit well behind the gain-line (or sneak an interception). The defender fails in his gamble. De Luca cuts inside and gets behind him. 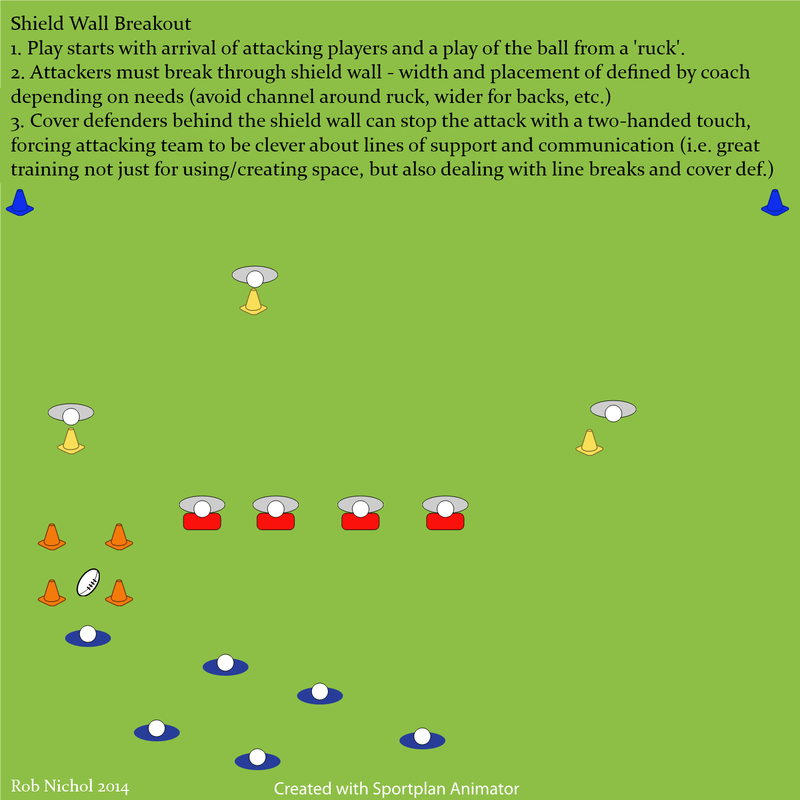 Defensive line compromised and line break achieved, with others having to cover the outside centre’s mistake. De Luca draws those covering defenders and makes a simple pass to Ansbro who also has plenty of space and side steps the final defender for a great try. As one announcer says, “Simple move, done well.” That’s it. 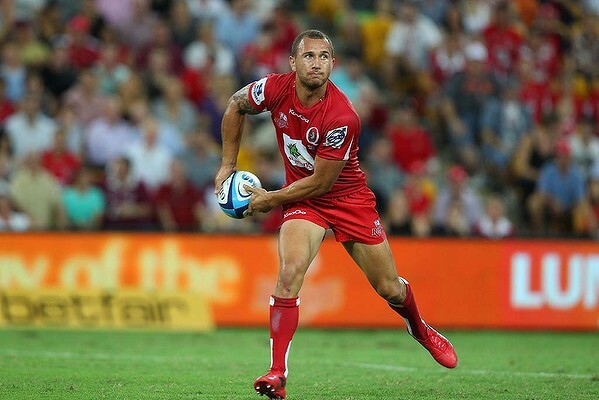 That’s all rugby needs to be. 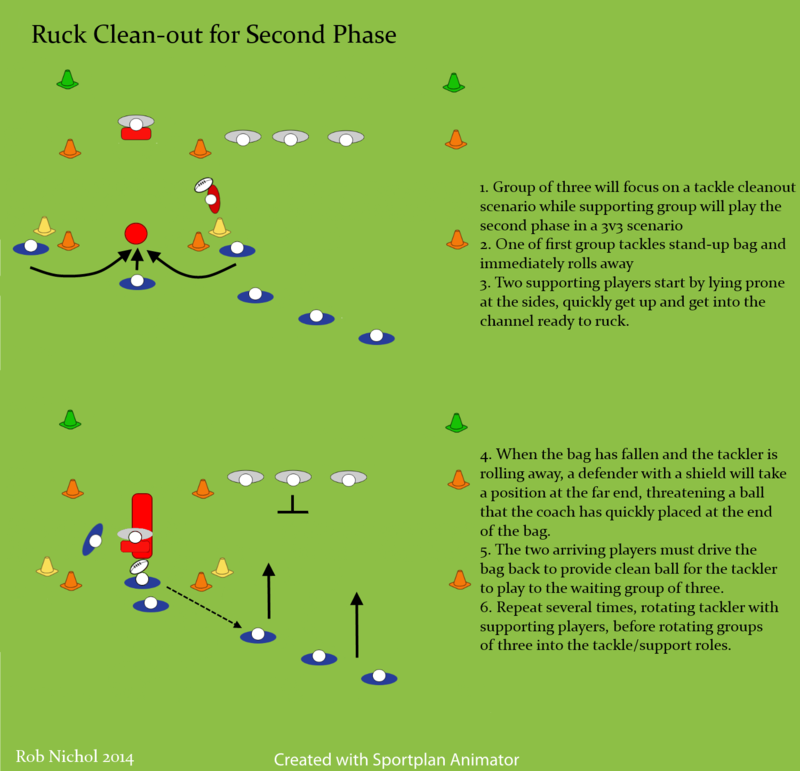 It’s probably a rehearsed move, but the real killer elements are: the first decoy run which has the defence condensed from the get-go and also causes them to halt their forward run; the first deep pass which gets the ball to a play-maker in space with plenty of time to act; and the second deep pass, without hesitation or an unnecessary run, to free up the strike runner who catches his man making the wrong choice in a risky situation all based upon what to do when there’s too much space between. … on second viewing, I noticed the second decoy runner in the backs, but think I missed it the first time as he probably wasn’t necessary. Finally, it’s interesting watching the head-on replay as you can see #8 freeze dead because of the decoy, #7 come in to ‘help’ 8, but then have to cut back out. 10’s on the first passer’s outside shoulder and points for help from 7. By this time, the defence is tracking sideways – never an ideal situation as they’re susceptible to cut-backs. 13 has made his gamble and all three covering defenders panic in focusing on De Luca, freeing up Ansbro for the simple run.